greggcestaro.com Sally Daneshjou is a new and emerging Haute Couture designer out of Austin Texas. She is designing these amazing luxurious formal and wedding gowns made from fine Italian fabrics and made in Italy by Italian ateliers. Her designs define the feminine shape. We had a rather short time to put all this together before Fashion Week. It was in the middle of Austin Fashion Week, a few months back and a day before her show, that the entire collection finally arrived. Early morning saw us at her elegant studios with models Brittany and Eugenia in hair and make-up as I set up the studio in the large foyer. She asked for a simple white background for the lookbook and for her new website, sallydanehjoucollection.com. I shot this shoot with a single light and 7 foot shoot-through umbrella and a 200mm lens stepped down a stop or two. Natural light shown through but made little effect from the 800ws diffused light. The models came in and went through the motions as music played in the background. The importance for me was to get the structure and patterns of the dresses, details, color and playful emotion and beauty shots. There was plenty to shoot and little time as I had to be downtown for an event after lunch, but as the rhythm of the shoot progressed time flew, and before I knew it we were on the last dress. Post production began with selecting best images for the website which needed to be uploaded that night for the show the following day. I made sure the sensor and lenses were clean, the lighting was spot on so that post-production would be simple and easy since time was of the essence. Production of the initial lookbook for the collection also progressed immediately as well. I opted for a square format, with full body and details blended together. I felt this allowed for an image rich splash for the collection. The image of the long white dress with bow and arms stretched out spoke to me as the cover as it seemed to best represents the free spirit of the collection. The back cover I designed as a 4 image detail shot window pane with logo in the center. The intro-page features Sally backstage of her show and a runway shot (by Gerry Hannan) and an introductory note about the collection. The rest of the pages peppered in best views of the dresses and closed with an Ad of the studio behind the scenes and the collection on the runway shot by Gerry Hannan. Both Gerry and I shot as house photogs for Austin Fashion Week via Advertising and Marketing specialist Cheryl Bemis’s magazine FashionablyAustin.com. Gerry shot front of house, I shot back of house (Behind the Scenes). 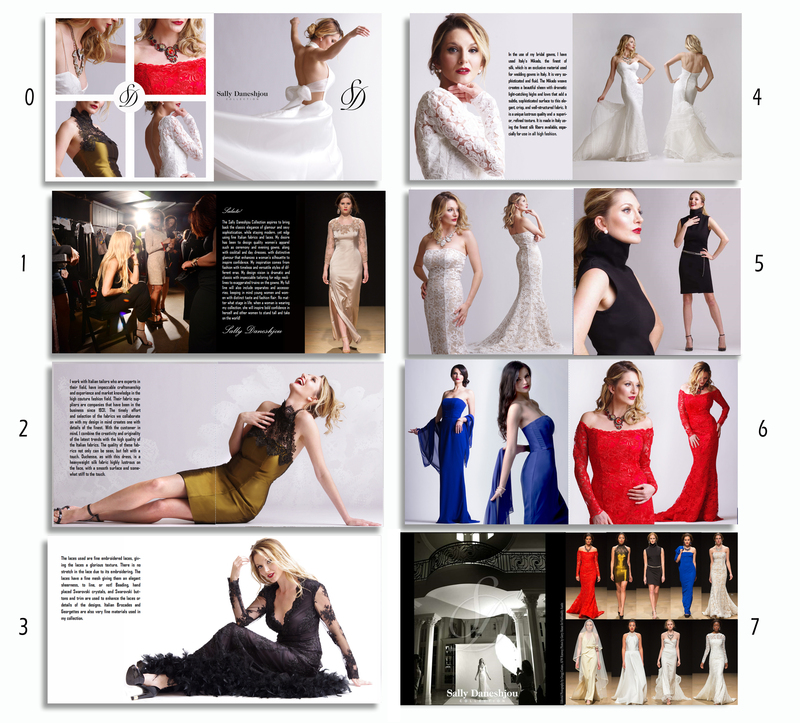 The initial lookbook was finished and uploaded as a flipbook on issuu.com. It’s not done yet though, the total lookbook concept will also feature on location editorials design as a 10 pager “special-section” in the center slots of the book. Videos, Advertorials, and other editorials to come. It is very exciting to ground floor a new and amazing fashion start-up with so much potential and beauty. This entry was posted in Advertising Design, Art, commercial, editorial, FASHION, Interior Design, Model Photography, Photo Design and tagged Camera hints, Fashion Models, Fashion Photography, Graphic Design, Hair and Make-up, Magazine Ad, Runway Model, vintage style. Bookmark the permalink.